Screwing around with an idea, so this was a practice run. 30" grass carp. Kerby, tell us more...is this a painting or a mount? Looking at the dorsal fin makes me think it might be a mount. If not, what a precise painting, you are quite the skilled artist/biological illustrator. How did you catch the grass carp? I have seen some huge ones, they are so large they startled my normally stoic Labrador who was retrieving bumpers in the Imperial County, CA. canals where grass carp abound. For those unfamiliar, grass carp do not easily take a baited hook, they are primarily vegetarians. I often thought using frozen green peas might work...but of course it would be a tough battle landing 20-30 lb. grass carp on no. 10 or smaller hooks... Curiously, grass carp are protected in So. California, the property of the Imperial Irrigation District, each one is pit tagged and their job is to graze hydrilla in the canals. I got the grass carp from someone who is licensed (Indiana) to sell fish from his fish farm. Cecil Baird from Indiana. 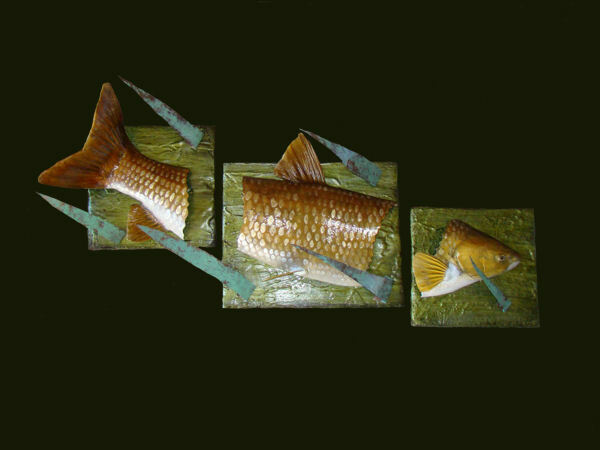 I had originally molded the grass carp and then made a reproduction. One half of the 2-part mold broke. I kept the other half of the mold ..... and then 10 years later decided to pour a cast from that half mold. And I am preparing a piece for the World Taxidermy Show in May. Besides all of the different taxidermy categories there is also a Creative Arts category and I have an idea with a wiper (white bass & striper hybrid). So I used the grass carp as a test run. So no, it is not a drawing. The mold is made out of bondo, the cast is made out of bondo and the fins are made of IE 3030 (Innovative Polymers). And the three squares are just OSB borard with some bondo smeared on it and then painted. interesting concept of a mount. very artful. progress with this. i like it.